The art world is watching with concern the unfolding story of a fake Frans Hals painting; facts are still developing as of this writing, but it’s possible that the work may not be an isolated forgery but rather the harbinger of a larger group of well-executed fakes that could shake up the Old Master market. 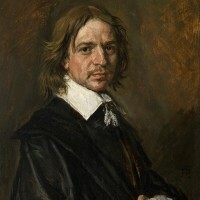 The story begins in 2011, when Sotheby’s brokered a private $10 million sale of a painting purportedly by Dutch portrait painter Frans Hals; it had come to Sotheby’s through a chain of ownership that can be traced back to a French collector named Ruffini. The work had been vetted by France’s Center for Research and Restoration, which believed it was an authentic previously-unknown Hals; at one point prior to the 2011 Sotheby’s sale, the French government had called the work a national treasure, and had tried (unsuccessfully) to raise the money to purchase it for the Louvre. But earlier this year, a different painting, currently owned by the Prince of Lichtenstein—purportedly by German Renaissance painter Lucas Cranach the Elder—was seized by French authorities who suspected it was a forgery. This “Cranach” had also come to market with a provenance that could be traced back to Ruffini. Based on the red flags about the Cranach (which is reportedly still under investigation at the Louvre), and the fact that the Hals and the Cranach had come from the same source, Sotheby’s arranged for the Hals it had sold to be sent to a specialized lab for scientific testing. (Incidentally, the same lab, Orion Analytical, also played a key role in analyzing and confirming the forgeries involved in the Knoedler scandal.) Test results indicated that the “Hals” contained modern materials and is a fake. Based on these tests, Sotheby’s has now rescinded the Hals sale and refunded the purchaser (reportedly an American collector based in Seattle). It has also been reported that Sotheby’s is considering legal action to recoup the refund from London dealer Mark Weiss, who was the previous seller in the Sotheby’s private deal. But the real fear is that the problem extends beyond the Hals; it turns out that Ruffini is the source of a number of previously-unknown Old Master works that have been sold into the market in recent years. A work attributed to Gentileschi, which was “discovered” in 2012 and at one time hung in London’s National Gallery, has fallen under suspicion. Likewise, a work attributed to Parmigianino, which in 2014 was displayed on loan to New York’s Metropolitan Museum of Art, is likewise now being reexamined, given the presence of Ruffini’s name in the provenance. And some speculate that dozens of works could be involved. Ruffini has taken the position that he is himself a collector, not an expert, and never presented any particular painting as authentic; rather, he says, other experts who attributed the works to various great artists. (Indeed, he has sued the party to whom he first sold the Cranach when it entered the market, claiming he was cheated on the sale price because the work was only later attributed to Cranach.) But the cloudy facts and common threads surrounding the fakes and potential fakes have raised fears of the possibility of a sophisticated forgery ring. Unsurprisingly, parallels have already been drawn between these potential Old Master forgeries and the infamous Knoedler forgery scandal, which has been playing out in newspapers and in the courtroom for several years (see here for our previous stories). As our previous posts outline in more detail, the Knoedler forgeries originated with a dealer, Glafira Rosales, who claimed to represent a mysterious art collector (whom Rosales and Knoedler referred to as “Mr. X”) who was liquidating a previously-unknown collection of Abstract Expressionist masterworks; but Mr. X was a fiction and Rosales has since pled guilty for her role in peddling the forged works (which were actually created by a little-known artist in Queens, who has since fled the country). Here, at least one publication has observed that in the Old Master forgery scheme, there may be a similar “Mr. X” figure; Ruffini has said that, as to several of the works he sold into the market, he either bought or received them as gifts from a woman named Andrée Borie, who had in turn inherited them from her father, André Borie, a French engineer. Unlike Knoedler’s Mr. X, we know that André Borie really existed as a matter of historical fact; but one art historian has noted that he could find no indication in the historical record that Borie collected art. And some have suggested that the possible Old Master forgeries are in some ways more troubling than the Knoedler scandal, given that they may represent forgeries of a wide variety of artists; and another press account quoted a dealer as suggesting that in some ways, it is arguably easier to fake a 20th-century work (like the Knoedler forger did) than a centuries-old portrait by an Old Master. Another interesting detail that has emerged from the story is the role—and conflicting conclusions—of various experts who have examined some of the suspect work. The Art Newspaper has reported that Sotheby’s, Christie’s, and others had passed on the “Cranach” before it was sold to its current owner. And back in 2008, prior to the Sotheby’s sale of the Hals and prior to the revelations about the Cranach, Sotheby’s rival auction house, Christie’s, had apparently examined the Hals work and declined to accept it for auction. Christie’s has confirmed this, saying, “we could not satisfy ourselves in terms of provenance and attribution.” The public does not have the details on what precisely Christie’s early concerns were about the Hals, but the story shows that experts can reach very different conclusions based on examining the same work with the same provenance. The scope and import of this unfolding story are still developing. But it serves as an important reminder that forgeries exist in the market, connoisseurship has its limits, and even experts can be fooled; buyers of fine art are advised to protect themselves by conducting thorough pre-sale diligence and engaging counsel to carefully draft contractual warranties regarding provenance and authenticity.